Tugboats dock an oil tanker on a crude oil quay at a port in Zhoushan, eastern China's Zhejiang province, Nov. 11, 2016. China's dependence on foreign oil is growing and is likely to keep rising for decades to come, experts say. Despite increases in international oil prices this year, China's domestic crude production has continued to slide. Asian oil prices have jumped nearly 40 percent from their low point in June to a high in November. But China's crude output has dropped 4.1 percent through October after plunging 6.9 percent last year. China's state-owned oil giants have yet to respond to higher prices with increased production, although prices have already climbed past the range of U.S. $45-55 (297-363 yuan) per barrel, which would cover their presumed production costs. In October, domestic output dipped below 3.8 million barrels per day (bpd) from the average rate of 4 million bpd for all of last year, according to the National Bureau of Statistics (NBS). The October level was near a low set in August, a record since the NBS began publishing data in 2011. While production is lagging, imports are rising to meet China's growing demand. In September, crude imports soared 12 percent from a year earlier to a near-record of 9 million bpd. Imports have averaged 8.4 million bpd so far this year, according to customs figures. Month-to-month changes have been attributed to a host of variables, including government-set quotas for imports by independent refiners. But the longer-term growth of imports over domestic production has been a consistent trend. This year's spread between rising imports and falling production has already surpassed China's forecasts for 2020 under its Five-Year Energy Plan, released by the National Energy Administration (NEA) and the National Development and Reform Commission (NDRC) in January. Falling investment at China's major oilfields, like the decades-old and now depleted Daqing field in Heilongjiang province, is likely to extend last year's drop in output through 2017. China's import dependence first reached 50 percent in 2008, gradually rising to 64.5 percent last year. This year's pace has put China's reliance on track to reach 69 percent. As fast as the proportion is rising, a recent study by the International Energy Agency (IEA) found no signs that it will slow down. By 2040, China's import dependence will hit 80 percent, the Paris-based IEA said last month in its annual World Energy Outlook. In a rare official comment on rising import dependence, a Ministry of Land and Resources research center said Saturday that China is "likely" to keep the import ratio within 70 percent until 2035, the official Xinhua news agency reported. 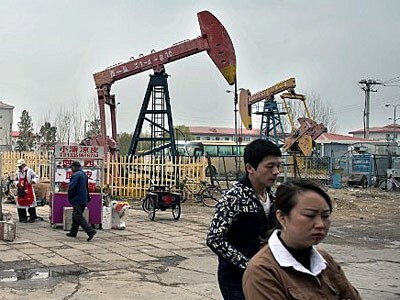 Over the long term, the decline in China's oil output will prove "difficult to reverse" due to complex geological conditions at oilfields that "struggle to break even at (U.S.) $40-50 (264-330 yuan) per barrel," the IEA study said. Even taking new "tight oil" and offshore resources into account, production is forecast to slip to 3.1 million bpd, while demand will rise 35 percent to 15.5 million bpd, including bunker supplies for marine and aviation fuels. China will become the world's leading oil consumer sometime soon after 2030, according to the IEA forecast. In 2040, China's net imports are expected to rise to 13 million bpd, taking up nearly 30 percent of all internationally traded oil. China's annual costs for imported oil will grow more than fourfold from about U.S. $110 billion (727 billion yuan) now to U.S. $460 billion (3.0 trillion yuan) by 2040, the IEA said. China has taken a series of steps aimed at reducing the risks to its energy security, including diversifying its sources and increasing its overland supplies with pipelines through Russia, Kazakhstan, and Myanmar. But limitations of production and logistics will make these only partial solutions. "This means that, in our projections, China has little alternative but to turn to its existing main suppliers in the Middle East for an additional 1.6 million bpd of supply," the IEA said. "This in turn would increase its reliance on trade via the Straits of Hormuz and the Strait of Malacca, two potential strategic chokepoints in global trade," the IEA said. Mikkal Herberg, energy security research director for the Seattle-based National Bureau of Asian Research, said that prospects for a turnaround in China's oil output due to this year's higher prices appear remote. "The notion that they might somehow suddenly increase domestic oil production seems extremely implausible," said Herberg. "Even if they can keep it flat, they're still headed toward 80-percent import dependence," he said. While pipeline deliveries may mitigate some of China's vulnerability to supply disruptions, an estimated 80 percent of its oil imports will still come by sea. "The 80-percent oil import dependence plus the 80 percent of that coming through the sea lanes will have pretty profound strategic implications for China," Herberg said. The IEA estimates that the Middle East will provide about half of China's oil supply in 2040, while China will consume about a quarter of the region's oil exports. The estimates may understate China's reliance on the Middle East for the grades of crude that it needs to refine into lower-pollution fuels. China recently completed a second pipeline from the Russian border to its petroleum center at Daqing, doubling the route's import capacity to 600,000 bpd. Russia has been China's leading supplier for nine months in a row, but it has been struggling to stem the rising sulfur content of the crude that it has available. In October, Interfax reported that Russia is bound by contract under an intergovernmental agreement to supply China with scarce low-sulfur oil, forcing it to raise the sulfur content of oil to its other export customers in Europe. 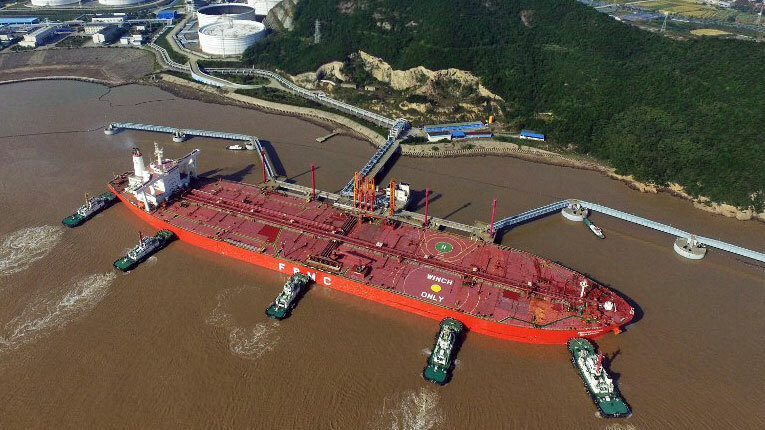 "The sulfur content of crude (for China) must not exceed 0.65 percent, according to agreements with Chinese partners, but it could take a year and a half to implement these measures," Interfax said. The sulfur content of oil available at some of Russia's western export terminals could rise to 1.8 percent next year as a result, the news agency said. China's growing reliance on imports is a crucial reason for its heavy investment in its twin trade and infrastructure initiatives — the Silk Road Economic Belt and the 21st Century Maritime Silk Road, known as "One Belt, One Road," or OBOR, Herberg said. These are likely to become linked through port development with growing naval access and support facilities to help protect China's energy security. "I think it adds a very powerful driver to China's blue water naval development and power projection capacity through the Indian Ocean, and developing a whole set of strong diplomatic ties with the littoral Indian Ocean countries," Herberg said. Herberg sees the potential for rising tensions not only with the United States over China's increased presence, but also with Japan, which depends on the same maritime routes for its energy supplies. "To turn over those vital sea lanes to the tender mercies of the Chinese navy will put the hair up on the backs of the Japanese strategic planners," he said. India is also greatly concerned by the implications of a Chinese buildup in the region. "They see this as part of the Chinese encirclement of India," Herberg said. Despite the potential consequences of China's rapidly rising reliance, the government has said little in recent years about the risks of import dependence, leaving it unclear whether it is a motive or a pretext for expanding naval power. "It's not just about oil," Herberg said.